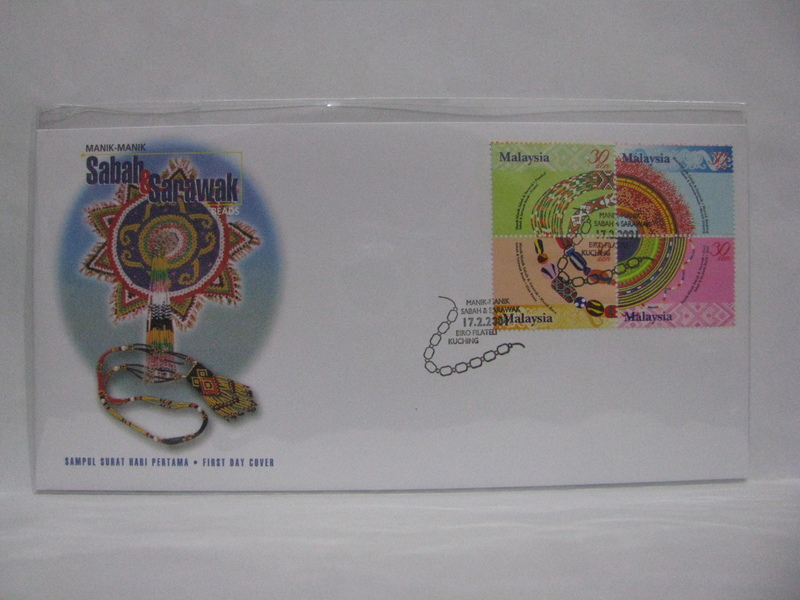 Here is a FDC cancelled in Kuala Lumpur with an additional Hong Kong Exhibition 2001 cachet. 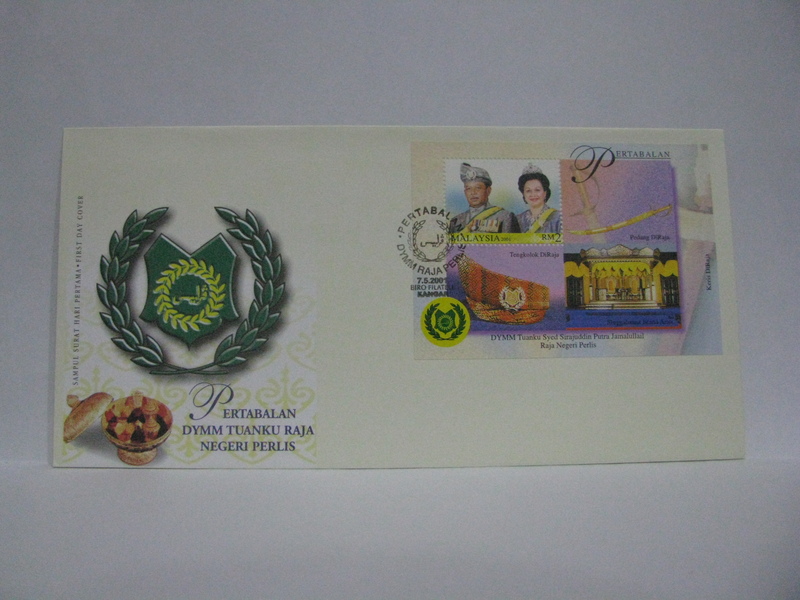 This is a fake cancellation, trying to imitate a “Putrajaya” only cancellation. 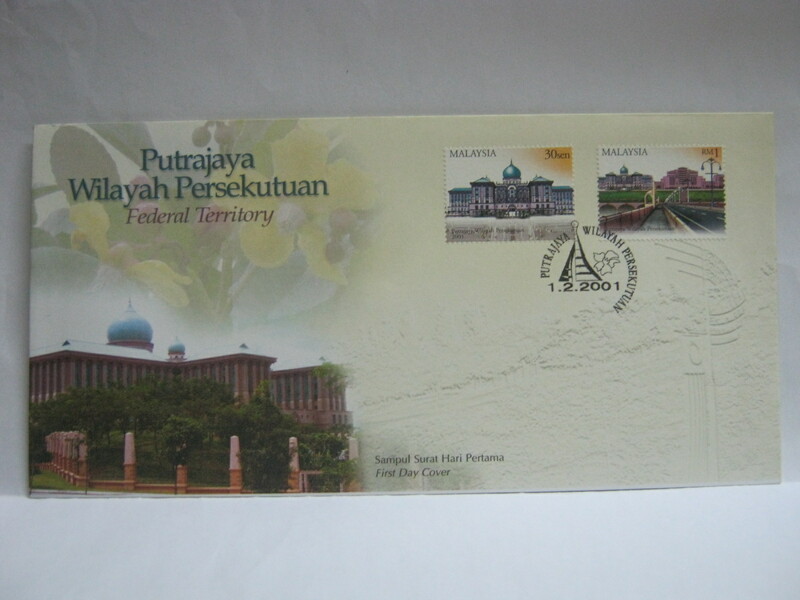 To the best of my knowledge, there was no cancellation issued in Putrajaya. 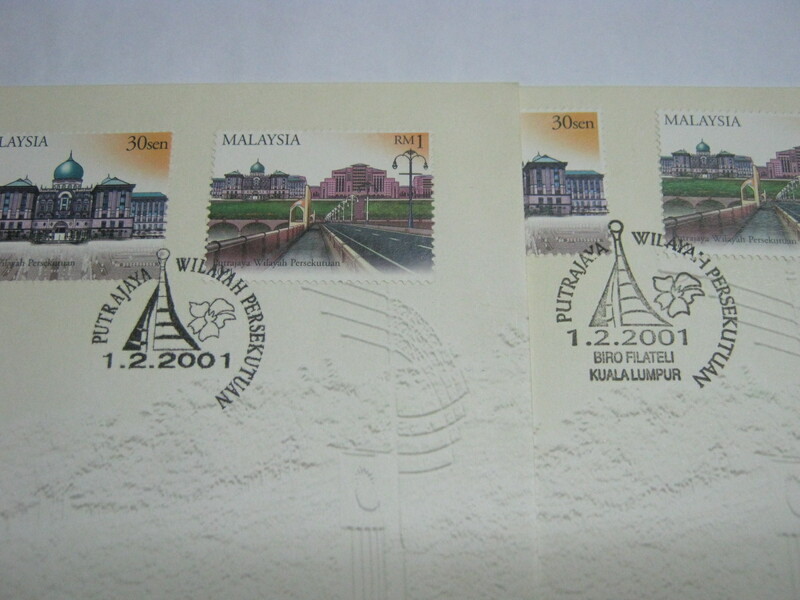 Notice the smaller fake (left) compared to the actual (right). 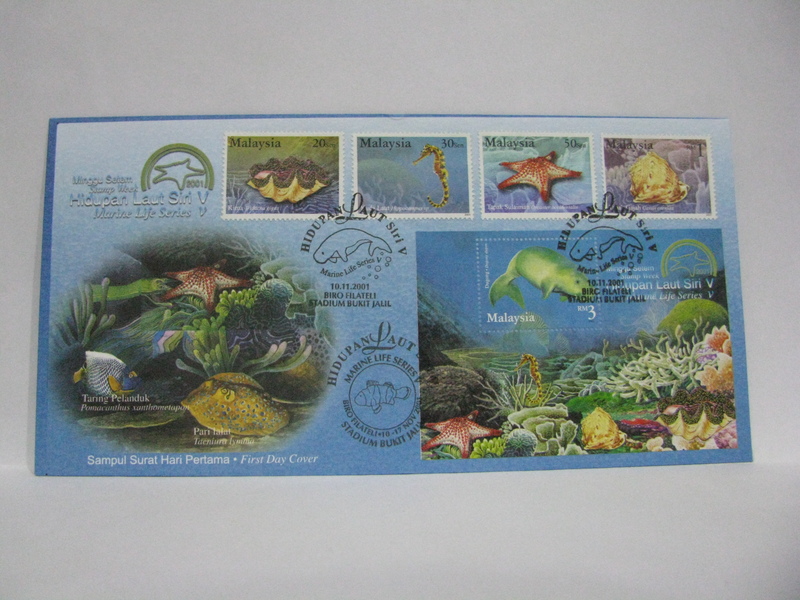 This FDC was cancelled in Kuching completing both locations relevant to the topic. 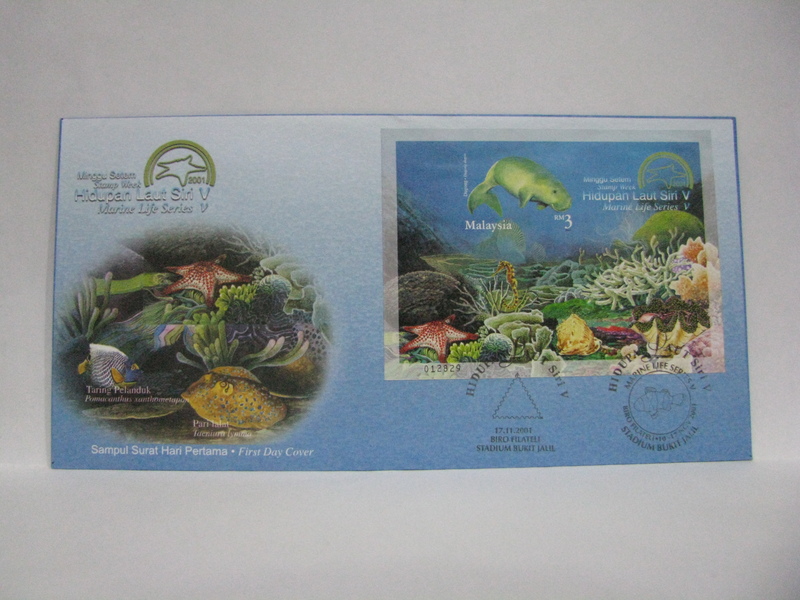 The FDC below is however a fake FDC. 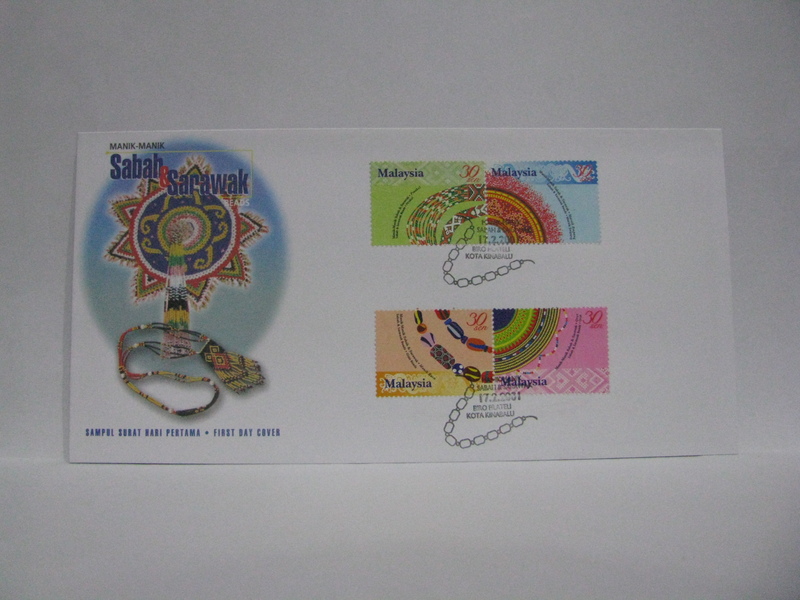 Notice the inkjet postmark as well as the word Sarawak? 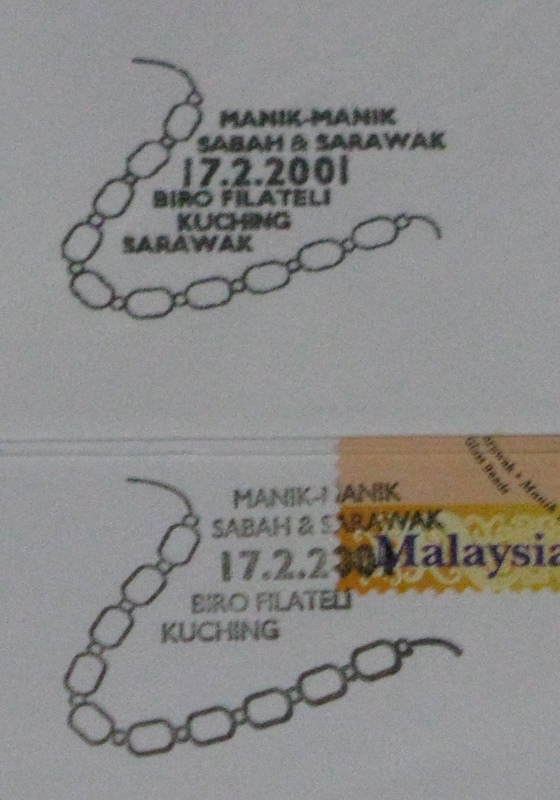 The actual Kuching cancellation does not have Sarawak stated in the cancellation (refer to the top picture). 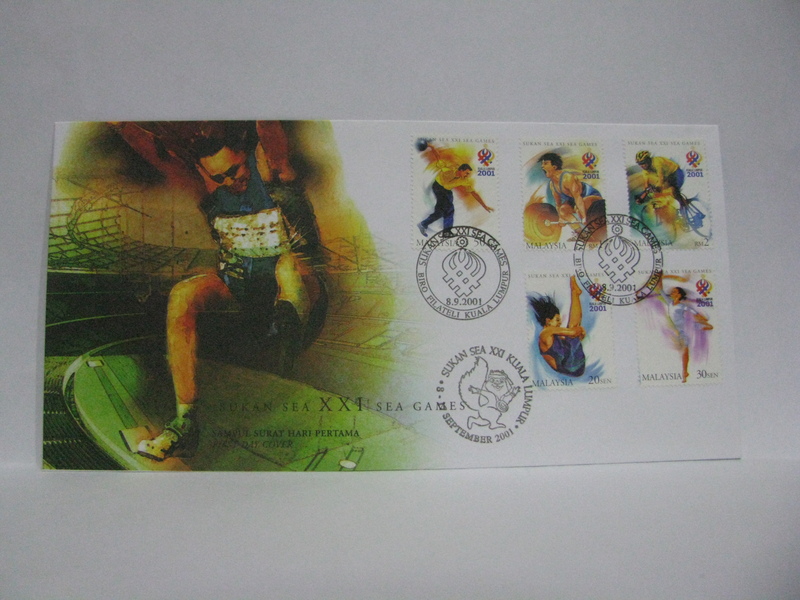 Here is the close-up. 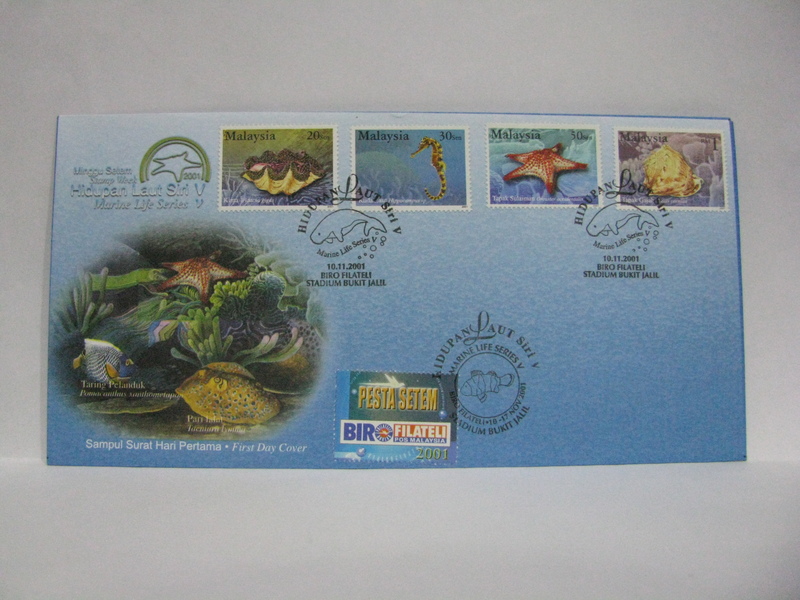 The fake cancellation is at the top. 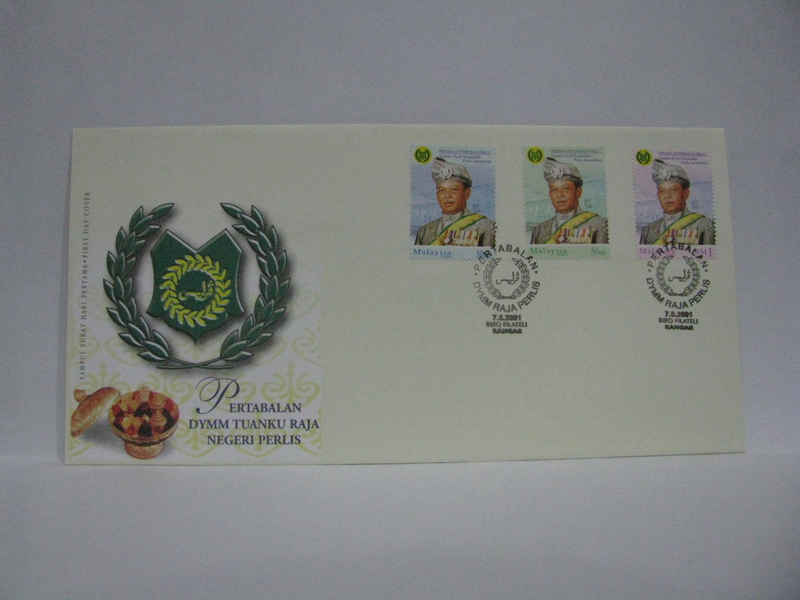 These FDCs were cancelled in Kangar. 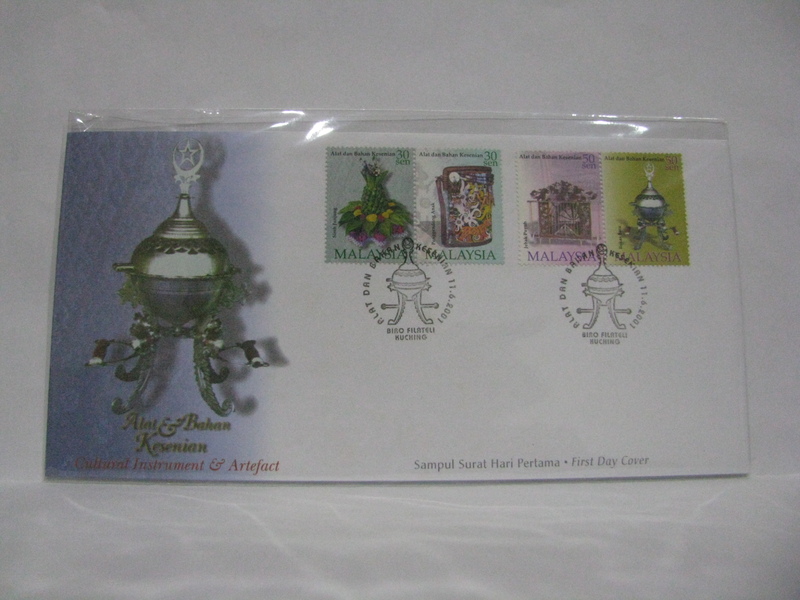 The FDC was cancelled with the PHILANIPPON ’01 cachet. 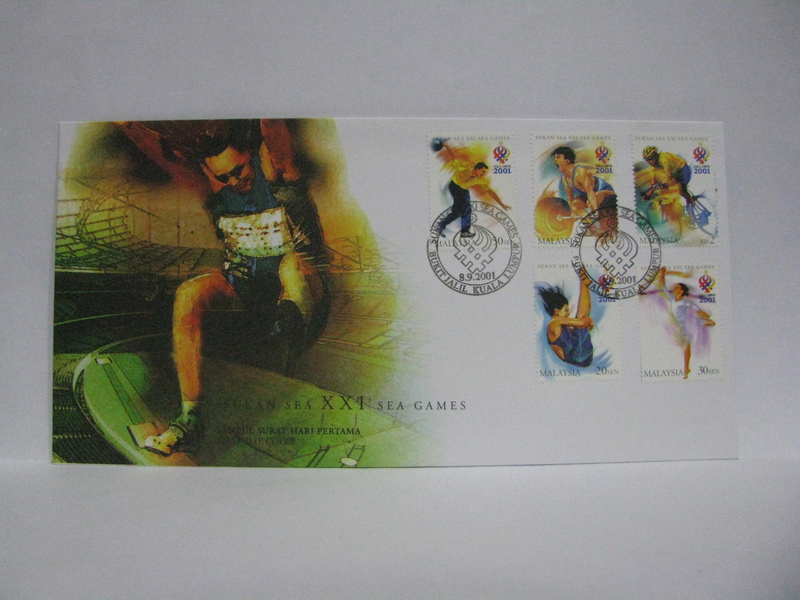 The FDCs were cancelled in Kuala Lumpur along with the XXI SEA Games cachet. 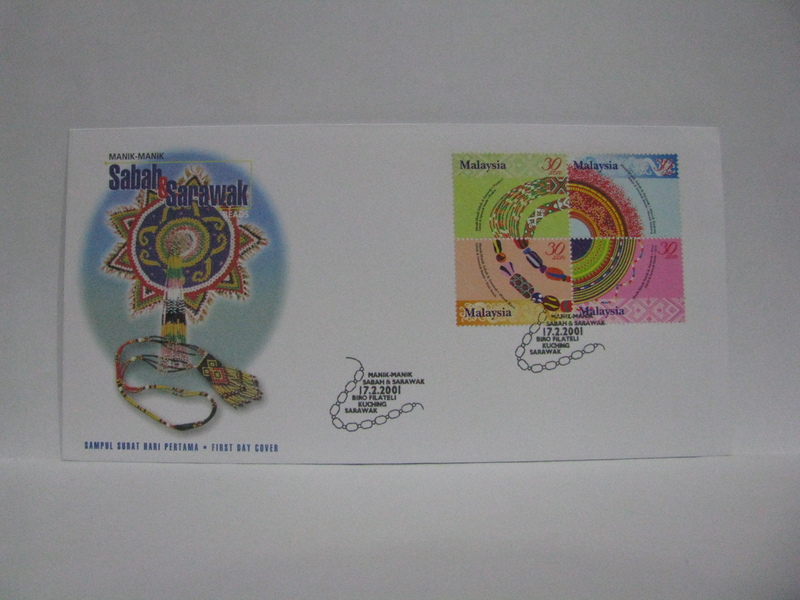 These FDCs were cancelled in Bukit Jalil Kuala Lumpur. 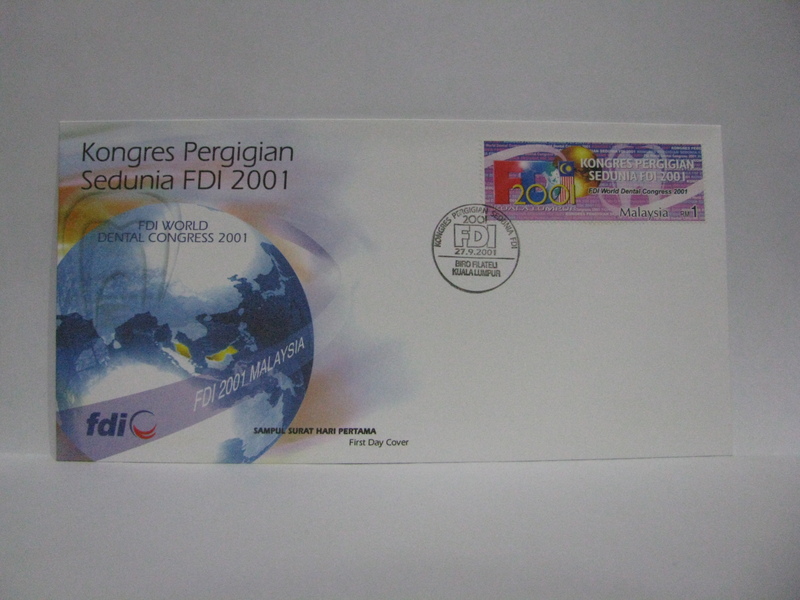 This FDC was cancelled in Kuala Lumpur and Putra World Trade Centre. 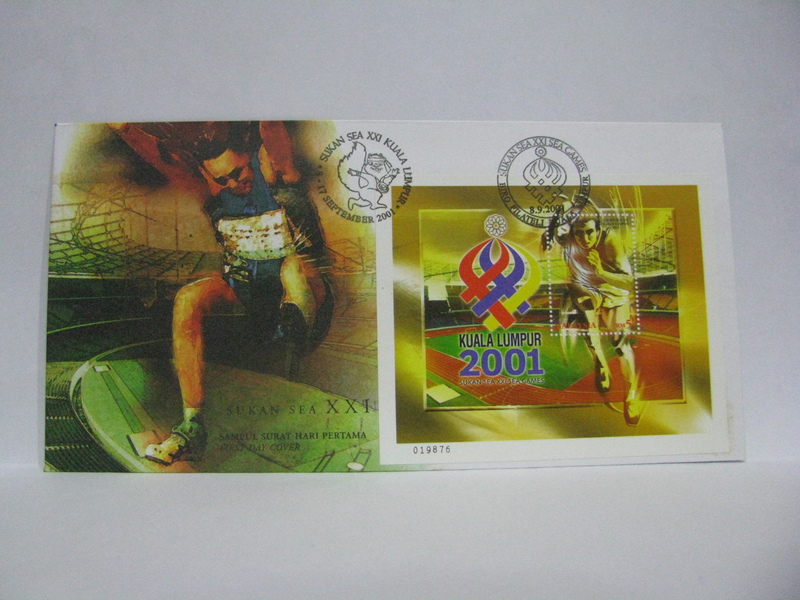 These FDCs were cancelled in Stadium Bukit Jalil along with the Stamp Week ’01 cachet. 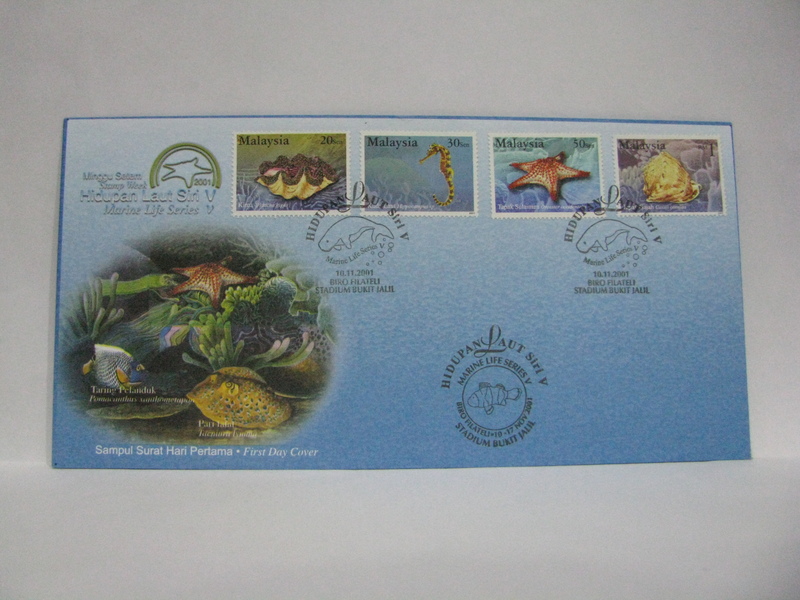 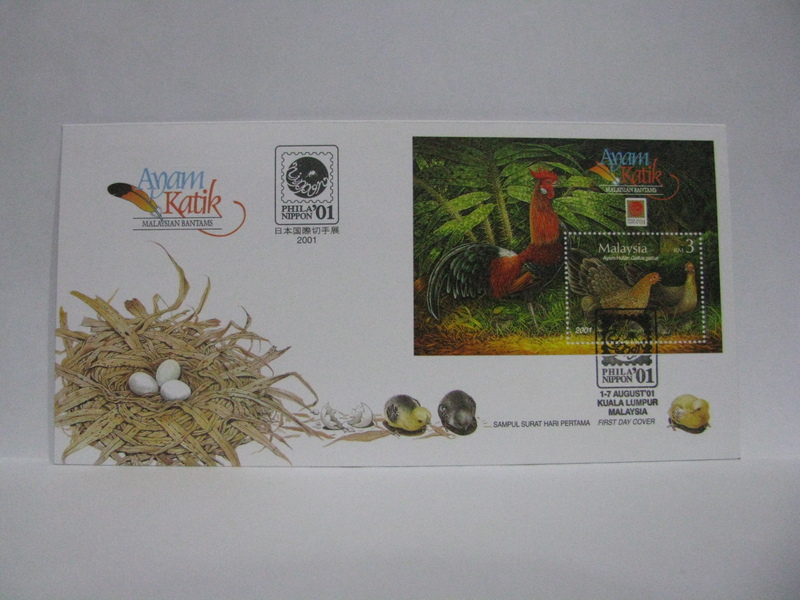 This is a FDC affixed with a souvenir stamp issued by Pos Malaysia. 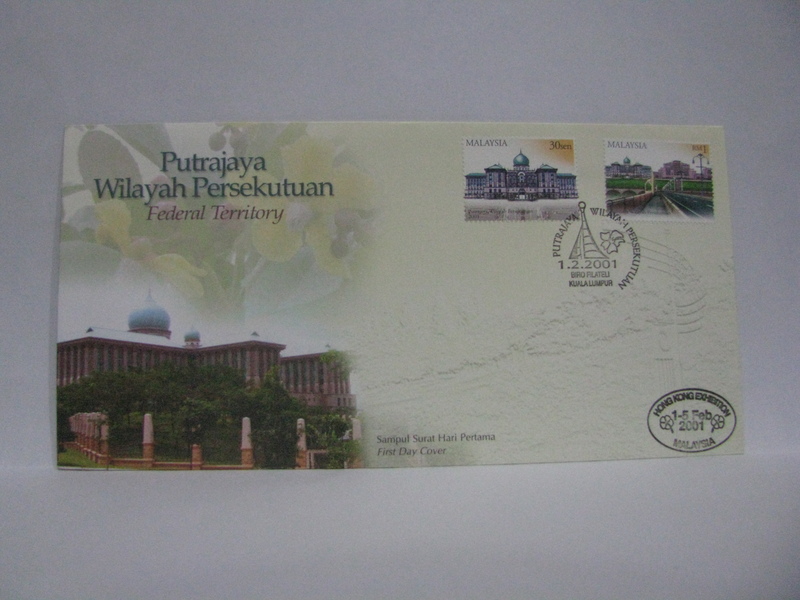 This is perforated. 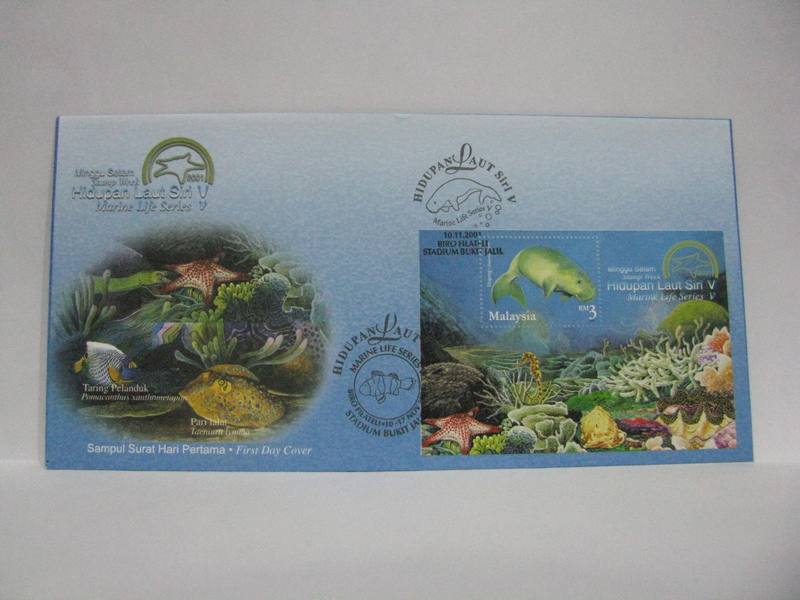 This is a composite FDC. 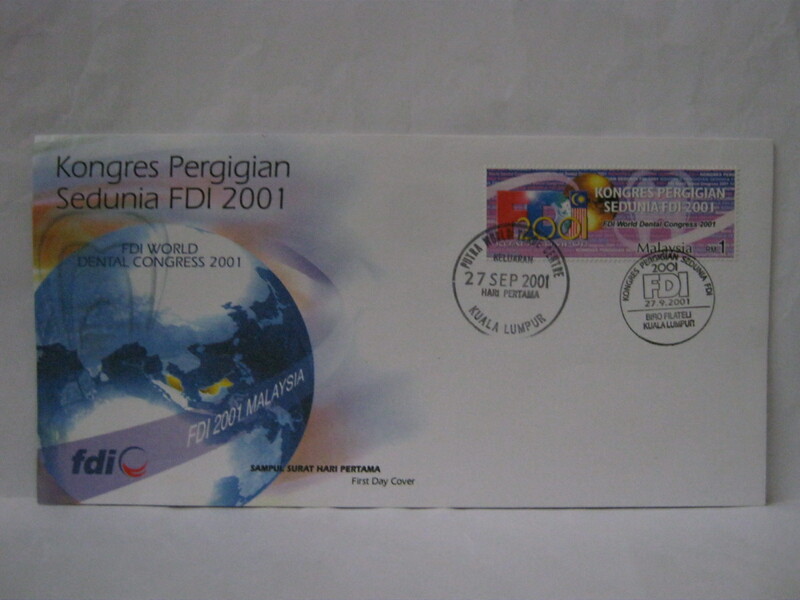 This FDC was cancelled in Stadium Bukit Jalil along with the Stamp Week ’01 on the day of issue. 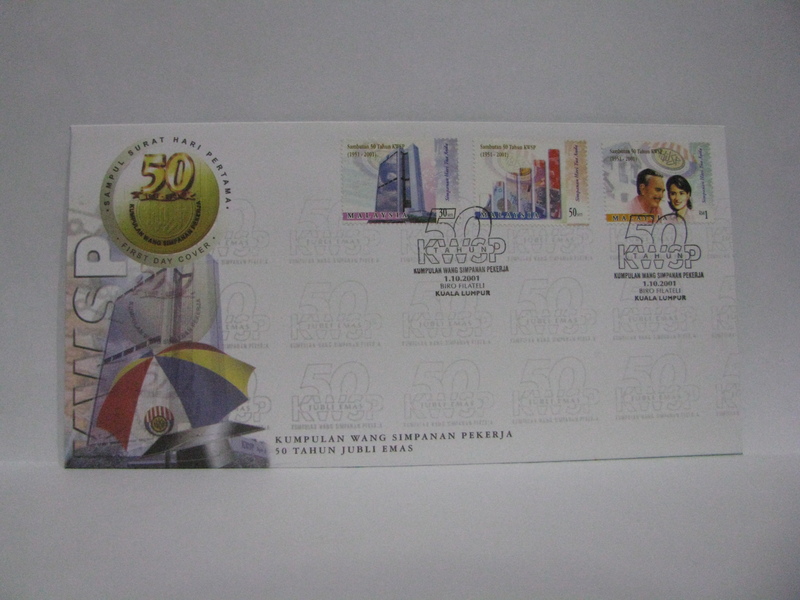 The imperforate miniature sheet was released on 17 November 2001. 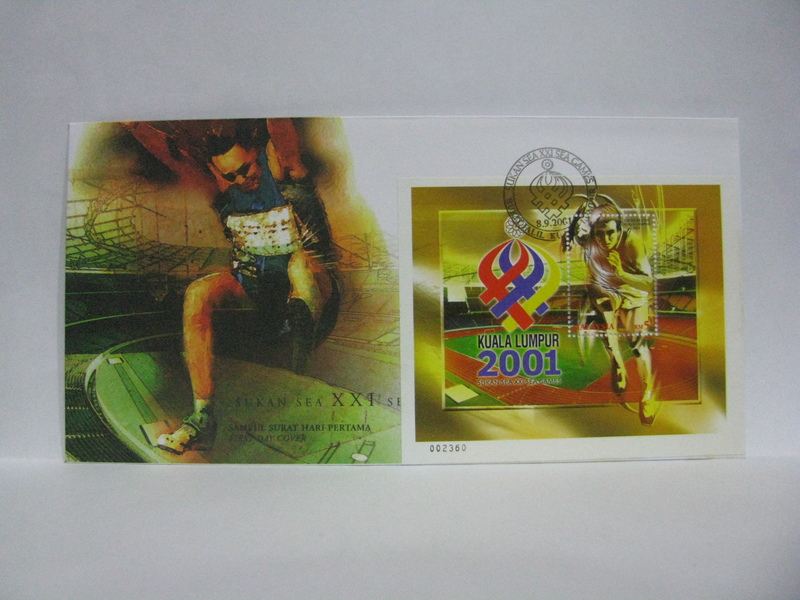 On the same day an imperforate souvenir stamp was also issued. 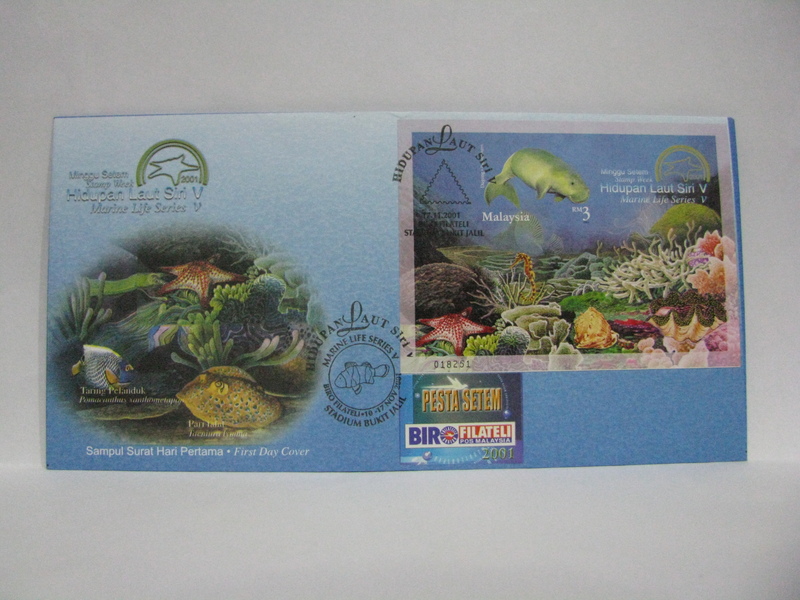 This is the FDC with the imperforate souvenir stamp affixed. 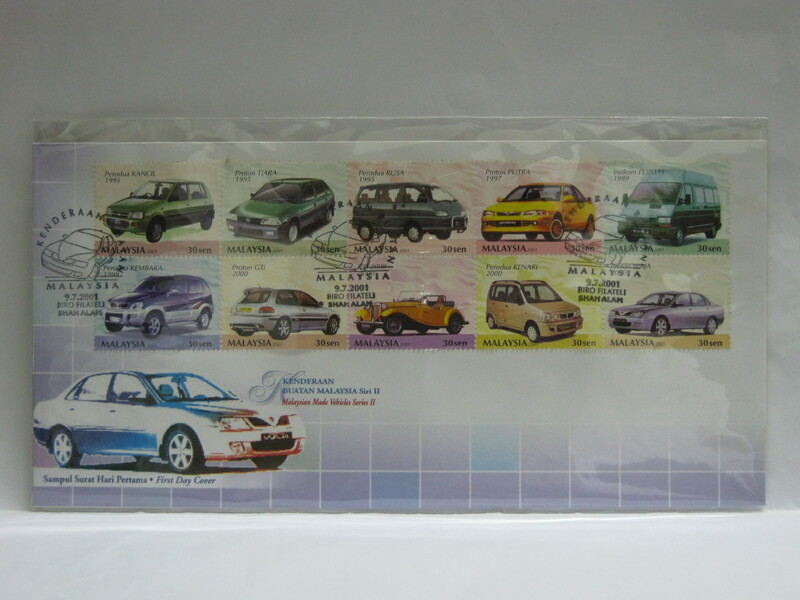 Note the different shade of the miniature sheet.